Hello Quick Quotes Readers! Louise here on the blog today with two feminine birthday cards that I made using leftover pieces from previous Club Q kits. The Club Q kits come with plenty of extra product, and the papers are so beautiful that I don't like to let any go to waste. These 2 cards were made from leftover pieces of the February and May Club Q kits combined with several colors of PowderPuff Chalk inks. The February Club Q contained many die-cut flowers. Although I used some in February, there were still enough flowers left to use on both cards. The papers, ribbons, and pearls also came from the February Club Q. The vines, chipboard bird, and "Happy" embellishment came from the May Club Q. For the blue card, I colored the chipboard bird with PowderPuff Chalk Ink in Sandy Shore using my ink blender tool, adding extra ink directly to the edges. I used the same technique to color the chipboard flowers with PowderPuff Chalk Ink in Tropical Punch. The green paper vines are edged in PowderPuff Chalk Ink in Cactus. I used the pearls for the centers of the flowers and the bird's eye. The birthday greeting was stamped with PowderPuff Chalk Ink in Midnight Confessions. 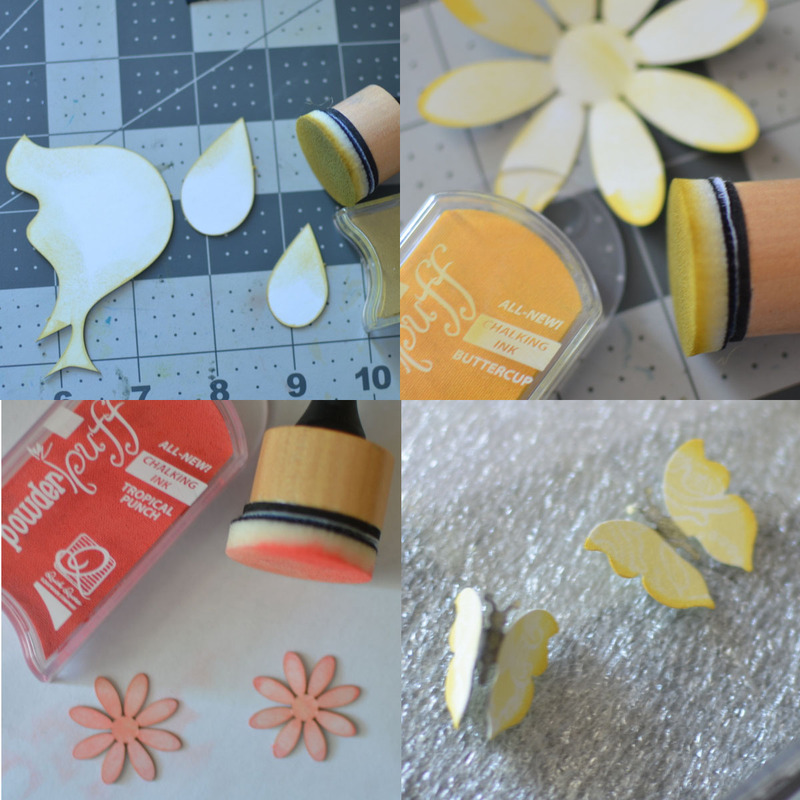 For the green card, I punched the butterflies from some of the scraps from the February Club Q.
I colored the flowers with PowderPuff Chalk Ink in Buttercup using an ink blender tool, adding extra ink directly to the tips of petals and the wings of the butterflies. To color the butterflies' bodies, I held the wings back and dabbed the middle onto PowderPuff Chalk Ink in Midnight Confessions. The "Happy" element and the background paper are inked with PowderPuff Chalk Ink in Limeade, one of the colors included in the Retired Colors PowderPuff Chalking Ink set. The word birthday was stamped with PowderPuff Chalk Ink in Midnight Confessions. Both my Mother and my Mother-in-law have summer birthdays and both appreciate a hand-made card. I know they will each enjoy one of these. I hope I have inspired you to make cards from the leftover pieces of your Club Q kits.